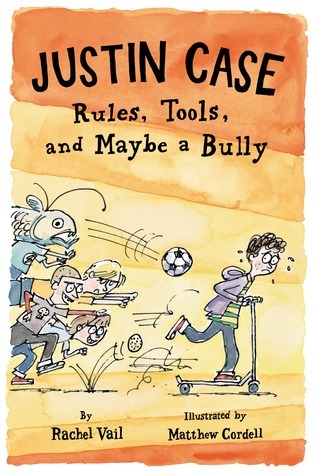 Justin Case – Rules, Tools and Maybe a Bully is the third in the series. It is helpful to read the other two boos before reading this one so you fully understand the story – but you can enjoy it as your first dip into the series just as well. My guess though, is that once you read it, you’ll go find the others to read too because Justin is a great character. You’ll be wishing to spend more time with him. What I love about Justin is that he’s not perfect and he’s not afraid to share that. He knows he worries. He knows he sometimes makes things larger than life by thinking about them, and he’s working on that. He’s working on bravery and courage. Justin is in 4th grade now. He has Mr. Leonard – the first male teacher he’s ever had – who communicates by raising his eyebrows. This is something Justin is not sure he understands so he’s trying to keep a low profile. Justin is trying to figure out how he fits in and who his friends are. He’s not a running around kind of boy. He’s not good at sports but he loves to play. He’s okay in school, but there are kids who are better. He knows that it’s not cool to like girls, but his first best friend is Daisy even though he doesn’t do very much with her anymore. His second best friend is Noah, but things are mixed up with him. Justin is trying to figure out if you can have best friends or if it is better to just be friends with everyone. He’s trying to figure out what is true and who he can trust – both kids and adults. After all, Justin told his mom something in confidence and they she blabbed about it with the other moms and that totally got Justin in trouble at school. He became known as a tattler – when he wasn’t really, or shouldn’t have been. Justin has to figure out whether he should listen to what everyone is telling him or whether he should listen to his heart. Justin’s solution is pretty amazing. I know Justin thinks of himself as a worrier and as pretty ordinary, but he’s not just that at all. Read Justin Case – Rules, Tools, and Maybe a Bully and let me know what you think.